After the Revolution, Americans wanted cultural as well as political indepen­dence, and they began to change the style of their buildings to reflect their change of allegiance. While the houses were not radically different—and still drew upon British sources—the high-style buildings of the new era bore a new and Ameri­can name. The Federalist party which, ironically, tended to favor British interests in for­eign affairs, was the party of the merchants and landowners. These were the people with the means to build important houses—houses that came to be known as having been built in the Federal Style. Like “Georgian,” the name “Federal” has more to do with who was giving orders than with who was designing the buildings, but somehow the name has stayed with us. It’s a catch-all for buildings that date from the close of the Revolution (1783) until the first great machine-age style, the Greek Revival, became popular in the 1820s and 1830s. Other terms used for buildings of the Federal decades are Adamesque and Neo-Classical. A trio of Scots brothers named Adam developed a distinct decorative style that became widely popular in England. In particular, Robert Adam brought to British architecture a first-hand knowledge of antiquity. He had visited the recently discov­ered ruins at Pompeii and Herculaneum, and he shifted the emphasis from columns and other echoes of classical elements to applied decorations, like urns and swags. The exteriors of his buildings tended to be less decorated than earlier Georgian Houses but his interiors were practically encrusted with neoclassical details. The Federal House looks much less like a temple than the Georgian designs that came before or the Greek houses that were to follow. None of the Adamses ever worked in America, but through their publications and other authors’ builders’ books, their style reached the United States. 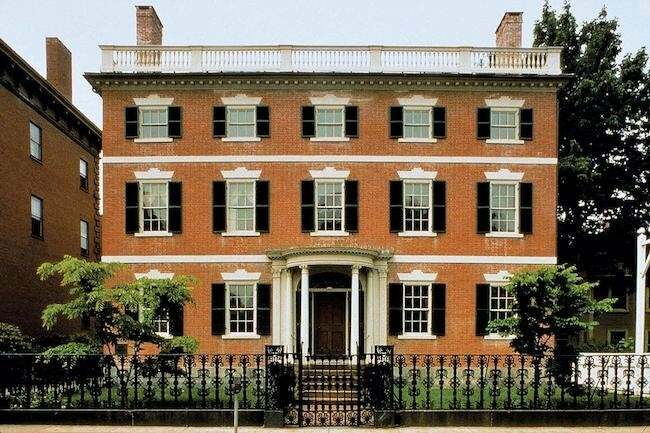 In Massachusetts, two architects named Charles Bulfinch and Asher Ben jamin took the Adamesque style and helped make it more American. Bulfinch’s fame is tied to his important Boston buildings, in particular the Massachusetts State House. But Benjamin is best remembered for his pattern books. He adapted the Fed eral Style to the predominantly wooden American house. Since he was working with boards rather than blocks of stone, his details tended to be thinner and more atten uated than his British antecedents’. Benjamin also believed that there should be a trickle-down of the neoclassical style of fine houses to rural farmhouses and more modest urban buildings, too. If the Georgian Style was primarily an aristocratic style, then the Federal had democratic aspirations appropriate to the politics of the new country. The typical Federal house shared the same basic configuration as the Georgian House, the form real estate agents today are fond of calling “colonial”—again, the Classic Colonial is a double-pile structure (that is, two rooms deep, front to back), with a street facade on the long side that features a center entrance in the third of the five bays. The Classic Colonial is two stories tall, and in its Federal form typically had at least two and often four chimneys arranged symmetrically on either side of the house. Hip or gable roofs were usual, though with a pitch that was typically flat ter than on the Georgian House. The first floor plan of the Georgian House, with four rooms, two on either side of the main hall, remained the norm, but often the rooms themselves assumed a greater variety of shapes and sizes. In the northeast, most Federal Houses were wood; in the south, brick was more common. The exteriors generally had fewer moldings though many examples took their cue from the Adams and featured carved decorations, like urns, swags, elliptical motifs called patera, and other elements borrowed from ancient Roman buildings. The windows were taller and narrower than in the Georgian House, the sticking between the individual panes of glass much thinner. Sidelights appeared on either side of the front door. The tradition of the fan sash over the entrance continued from the Georgian Style but with an important difference: In the Federal House, the fan sash is elliptical, rather than circular. While the comers of a Federal house are less likely to have pilasters than their Georgian predecessors (or the Greek Revival homes that would succeed them), the front doorways typically had flattened columns, usually in pairs on either side of the entry. The tradition of the entrance as statement, as “frontispiece,” continued. Inside, classical details adorned window and door architraves, mantels, cornices, and ceilings. Plaster and wood ornamentation tended to be graceful and delicate. The interior details of a Federal house are important attributes to be conserved. Ceiling medallions came into vogue at this time, many of them of plaster. Mantels had elaborate moldings, pilasters, and characteristic carving work and sometimes applied decorations. The front door and the stair case were two other elements of the house where the builder was likely to lav ish much energy and skill. A good rule to follow in your Federal house is to respect the original symmetry of the house and, as always, be on the lookout for original work.